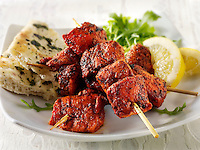 Chicken Tikka Masala Curry Indian recipe food pictures, photos & images. 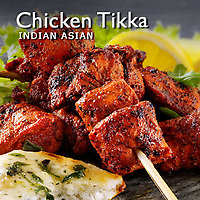 Tikka means “bits” or “pieces”. 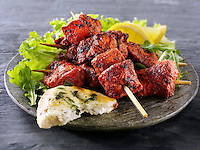 Chicken Tikka is popular in popular in Pakistan and India and is made by marinading pieces of chicken with spices then cooking them on skewers in a clay Tandoori oven. 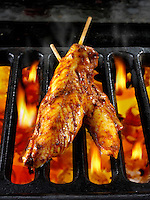 In the Punjab the Chicken Tikka is brushed with ghee and cooked over charcoal. 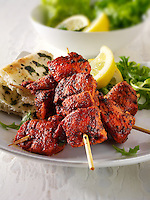 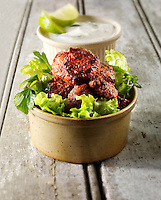 In restaurants Chicken Tikka is served as a starter on a bed of lettuce with lemon wedges or added to Chicken Tikka Masala. 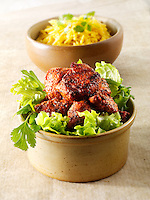 In Indian it is traditionally served with a coriander and tamarind chutney with onion rings and lemon.